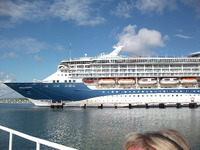 TUI Marella Discovery 2 out of Jamaica. Flying from Newcastle on the Dream liner. 14 days .Couple 58/63 Exotic Explorer & Cuban Fusion Jamaica,Belize,Guatemala,Honduras,Jamaica,Havana Cuba,Cozumel Mexico.Grand Cayman ,Jamaca.. First ever Cruise. Late deal 3 weeks before embarkation So no availibility to upgrade from an inside cabin. We did select out window seats on the plane as seats still availible. (at a cost) Cruise good value for money. Alocated the Cabin from HELL 2001 .It was next to a Crew room (night shift docking crew mess room) and above was a bar pantry (restocking after the bar closed and shows finished 12.30 pm) Complaint went in after the first night but told ship full so could not move rooms untill second week. Recieved assurances that the noise would stop but it was not untill night 5 that we got some sleep. Recieved £75 compenstation and moved second week. Sleep at last. new room no problem 2737 off the main corridor.The humm of the ship sent us off to sleep. Food and drink first class. Staff VERY attentive . Cabin OK . Unable to offer a comparison as first Cruise but just like Caravaning if you know what i mean.Small but cosy and practical. 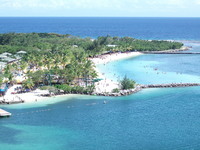 Excursions If you want to do your own thing then Roatan Honduras is the best beach . The ship docks near the beach and you can walk back to the ship any time for lunch & a drink. Access to the beach is an all day pass $14 each (inc sun bed) one of the cheapest on our trip. 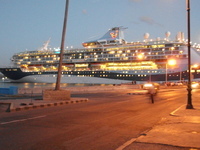 The ship docks in Havana Cuba just accross the road from the old town. Good for a walk about and sight seeing. (plenty of the old cars to do an hour tour at $20 each. An hour is more than enough to see the main sights) Good info provided each day in the form of a news letter left in you cabin each night and updates over the tanoy from captin Christopher Overall a good time . May do a Cruise again some time. Jamaica,Belize,Guatemala,Honduras,Jamaica,Havana Cuba,Cozumel Mexico.Grand Cayman ,Jamaca..
Late deal 3 weeks before embarkation So no availibility to upgrade from an inside cabin. We did select out window seats on the plane as seats still availible. (at a cost) Cruise good value for money. Complaint went in after the first night but told ship full so could not move rooms untill second week. Recieved assurances that the noise would stop but it was not untill night 5 that we got some sleep. Recieved £75 compenstation and moved second week. Sleep at last. new room no problem 2737 off the main corridor.The humm of the ship sent us off to sleep. Food and drink first class. Staff VERY attentive . Cabin OK . Unable to offer a comparison as first Cruise but just like Caravaning if you know what i mean.Small but cosy and practical. If you want to do your own thing then Roatan Honduras is the best beach . The ship docks near the beach and you can walk back to the ship any time for lunch & a drink. Access to the beach is an all day pass $14 each (inc sun bed) one of the cheapest on our trip. Overall a good time . May do a Cruise again some time.